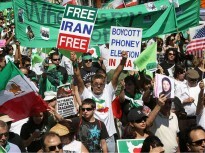 Iranian regime on the verge of collapse? 20 years ago Iranian Resistance warned that Islamic fundamentalism is the new global threat and its heart beats in Tehran but the world failed to take prompt action. Now, it is widely acknowledged that the Iranian regime uses its economic means, produce nuclear weapons and export fundamentalism and terrorism in the Middle East and throughout the world to organize crackdown measures and is the main international threat to the world's peace and security. How far can the Mullahs go? Iran's economy is crippled and the regime survives only by execution, torture and repression against its opponents. But is there an opposition movement that is strong enough? Contrary to what the Mullahs are trying to pose, the Iranian regime is entangled in five fatal crises, including the explosive and escalating popular discontent, Syrian and now the Iraqi people's uprising against Al-Maliki, impasse over the nuclear program, the regime's economic ruin and bankruptcy which it cannot prevent, and last the ruling circles are crippled with divisions and internal feuds. This is while Mullahs are on the verge of their presidential elections, which means that these divisions will become even more severe. Iranian regime has been caught in a devastated economy whose challenges are insurmountable; an economy in free fall, with a 60% inflation rate, 30% unemployment rate, a 300% reduction in the value of the national currency that has plunged to its lowest rate (One dollar now is more than 36800 Rials), and a negative 0.7% growth rate. Reuters reported on January 12, 2013 that among 177 countries around the world Iran's economy is rated 168.
International Energy Agency recently reported that Iran's oil export in October 2012 was 1,300,000 barrels per day, while in 2011 it was 2,300,000 BPD. Askar Oladi head of the Iranian Chamber of Commerce said very recently that: "our oil income has dropped to 1/3". The Iranian regime survives only by execution, torture and repression against its opponents. The average of daily execution in Iran is 2 persons per day and the average of hourly arrests is 80 persons per hour. This is why the Iranian people do not want this regime. massive explosion caused by the anger of the unemployed, the hungry and the impoverished. The fundamental reality is that this crisis has entered its final phase, producing acceleration in the tempo of developments and bringing the mullahs closer to making a choice between retreat, that would mean the regime's implosion and the beginning of popular protests, or continuation of the current policies that would end up with confrontation and collision with the international community leading to the regime's overthrow. It is clear that despite the existence of such lethal challenges, the mullahs' downfall will not be automatic and spontaneous. An organized movement is required to actualize the potentials of the current ripe circumstances and lead it to its eventual victory. The delisting of the PMOI has removed the twenty-year-old chains of a competent movement that can act as the fulcrum for regime change in Iran. The time has come for regime change in Iran. The Iranian people and their organized resistance have risen up to overthrow the regime. The international community must realign itself with the will of the Iranian people. Up until now, 120,000 political opponents, mostly members and sympathizers of the PMOI, have been executed by the regime in the past three decades in their struggle for freedom. Rudy Giuliani the former mayor of New York city said in a conference in Paris on November 17, 2012, that" In this particular case, Iran, there is a very clear alternative, like there was in Poland, the solidarity; it is a very clear alternative, this coalition that Madam Rajvi was able to put together". Despite all the possible measures adopted by the Iranian regime to annihilate the Iranian people's Resistance, but they failed. On page 27 of a fresh investigative joint report prepared by the Pentagon and U.S. Federal Research Division - Library of Congress conducted on Iran's Ministry of Intelligence confirms that: "After the 1991 Gulf War against Iraq, Iranian Ministry of Intelligence and Security (MOIS) made anti-MEK psychological warfare one of its main objectives, but MEK nonetheless has remained a viable organization". Patrick Kennedy also said in Paris on November 17, 2012 that: "The PMOI represents the most organized, political, financial, organization that is opposed to the ruling mullahs in Tehran". The Iranian Resistance with all perseverance as well as its democratic platform without any doubt is capable to overthrow mullahs' regime.The struggle to liberate the Iranian people falls in the same category of efforts to preserve international peace and security in the face of the threats posed by the religious fascism ruling Iran.